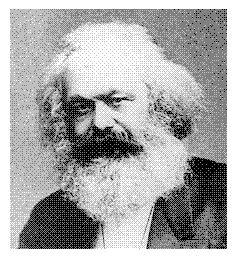 Karl Marx was a German philosopher economist and father of communism, Marx was awarded his doctorate by the University of Jena in 1841. His political activities entailed a nomadic existence on the Continent of Europe until, in 1849, he settled in London where he remained for the rest of his life. The Communist Manifesto, written with his friend Engels in 1848, summarizes his social and political philosophies. After years of scholarly research, much of it in the British Museum Reading Room, the first volume of Das Kapital was published in 1867, which was a work that analyzed the capitalist process of production. 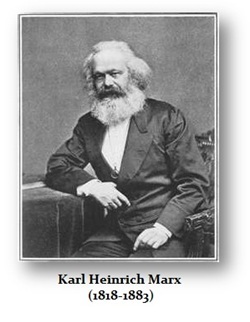 Marx elaborated his labour theory of value, which had been influenced by Thomas Hodgskin and Aristotle. The very essence of Marx was that a manufacturer that hires workers makes a profit over his cost. To Marx, this was exploiting the worker for the value of his labor was really higher. Marx attributed nothing to the creation of jobs by innovation. It was this difference between the cost of production and the profit that Marx believed was due to the workers. What Marx and others did not understand was the changing profile of the economy as industrialization was evolving. Marx quoted Hodgskin as recognizing the alienation of labor that occurred under modern capitalist production compared to agriculture where a farmer reaped what he sowed. Engels edited the further two volumes which were issued posthumously in 1885 and 1894. In this mammoth work Marx propounds his economic interpretation of history and the theory of class struggle. Capitalism is described as simply a form of social order that contains its own inherent contradictions. The labour theory of value, the exploitation and alienation of the worker, a falling rate of profit ensure an inevitable crisis, leading to revolution and eventually to the socialist state.